Volvox, one of the seven wonders of the micro-world. Wouldn't it be an interesting idea to make a list of the seven wonders of the micro world? Perhaps a list of seven would be too small since there are so many wonderful microscopic organisms. But a sure candidate for such a 'micro world hit list' would be Volvox. A close-up of individuals cells within the colony, 2 flagella and red eyespot are visible. Volvox is a Chlorophyte, or green alga. It exists as a grand spherical colony. Each little alga within the colony bears two flagella, whip-like hairs. The individual alga are connected to each other by thin strands of cytoplasm that enable the whole colony to swim in a coordinated fashion. 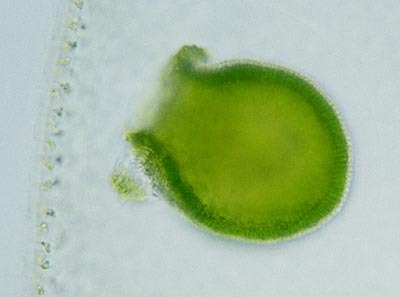 The individual alga also have small red eye spots. The colonies even have what we could call a front and rear end. Or, since Volvox resembles a little planet, a 'north and south pole'. In the northern region the eyespots are more developed. This helps the colony to swim towards the light. 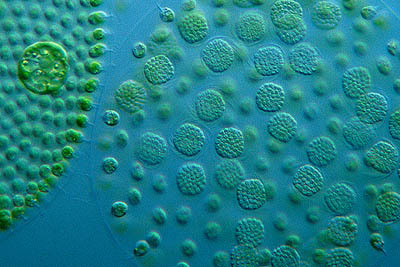 This differentiation of cells make Volvox quite unique. It is a colony that comes really close to being a multi-celled organism. Watching groups of colonies under the light microscope is a breathtaking sight. If you leave enough space under the cover slip (with the aid of spots of Vaseline under the corners) the spheres will swim slowly towards the light of the microscope, (use dark field illumination!). Volvox can be found relatively easy. They need quite clean nutrient rich water (Eutrophic) and it has to be warm so summer is the time of the year for a good Volvox catch. The best thing to do is to use a plankton net but if you are lucky you can also find them by squeezing pond scum. In a jar of pond water they will swim towards the light so they are often easy to find near the surface. The individual alga are connected by thin strands of cytoplasm. The two common species in my country are Volvox aureus and Volvox globator. 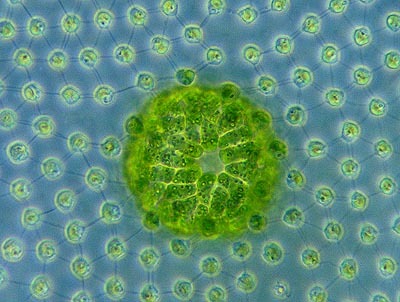 Volvox aureus is usually smaller and has less individual cells. Volvox globator may reach a size of 2 millimeters so they can be easily seen with the naked eye. If you are short sighted the larger Volvox aureus colonies can also be visible with a size of half a millimeter as small green dots. 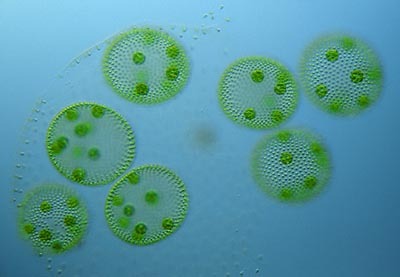 Although the colony is bigger, the individual cells of Volvox globator are slightly smaller (4 micron) than the cells of Volvox aureus (5 to 8 micron). 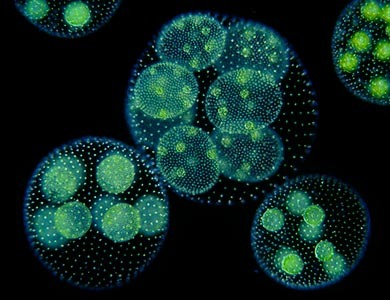 The cells of Volvox aureus are also a bit more egg-shaped. An easier way to determine the species is to look at the sexual reproduction of Volvox. A daughter colony turns itself inside out so the flagella will be orientated towards the outside of the cell. 'Birth' of daughter colonies after the older colony disintegrates. 'Grand daughter' colonies are already developing! It is not only their 'planetary movements' that make Volvox a sure candidate for one of the seven wonders of the micro world. It is also their interesting methods of reproduction that are really spectacular. They have asexual as well as sexual reproduction. One of the first things that you notice on Volvox is that most colonies have spheres inside. These are 'daughter' colonies, called gonads. It is a means of asexual reproduction. The gonads grow from cells around the equator of the colony. These cells enlarge and undergo a series of cell divisions until they form a small sphere. There is only one complication, the flagella will be on the inside of the new sphere. It has to turn itself inside out so the flagella will be situated towards the outside of the colony! Volvox also has a sexual reproduction. As in the asexual reproduction special cells are formed around the equator. These cells develop into special germ cells. Male and female colonies form different germ cells. Sperm cells are formed by division. The female germ cells do not divide. They enlarge to form an ova. Most species have male and female colonies. In some species the colonies are hermaphroditic. They are able to form sperm as well as ova. But not at the same time so self fertilisation is prevented. This images shows packages of sperm cells. They will soon swarm out in search of ova in other Volvox. 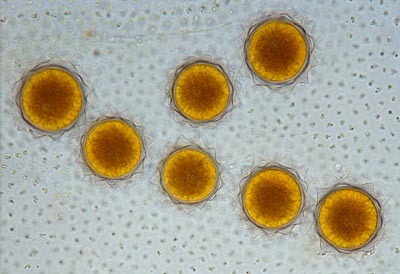 These are fertilised egg cells, the zygotes, of Volvox globator. After fertilisation the egg cells form a hard protective layer. Zygotes are able to withstand harsh conditions and will survive a winter. These zygotes make it easy to distinquish Volvox globator from Volvox aureus. 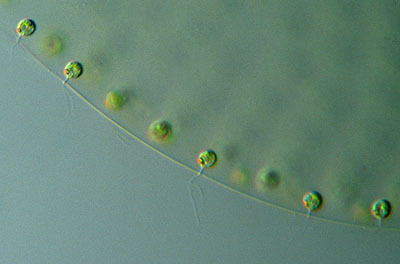 Volvox aureus has zygotes with a smooth surface. The zygotes of Volvox globator are star-like. Sometimes we can find inhabitants within the colony. There is a small rotifer, called Proales parasita that lives inside Volvox and feeds on the cells. 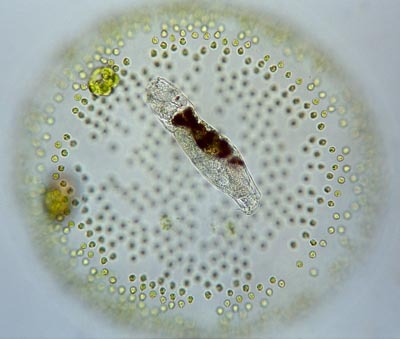 The rotifer is able to detect when the colony becomes immobile. When we observe Volvox under the coverslip it may be trapped by the pressure of the cover-slip. Proales will quickly make a hole and escape. There are many other flagellated Chlorophytes (green algae) that form colonies but they have less individual cells. Some are worth mentioning. Gonium makes a flat colony, Pandorina and Eudorina are more or less spherical. But none of them beat Volvox in sheer microscopical magnitude! In my opinion a list of wonders of the microworld can be short. The one single mega wonder of the microworld: Volvox. All photographs © Wim van Egmond 2003. Published in December 2003 Micscape Magazine.